Note: I'm not a mechanic, nor do I play one on TV. I'm just trying to assemble what I did to the best of my ability. I did a bunch of other stuff at the same time, so I might have missed a minor disassembly step here or there, but the essentials are all here. - Front and rear timing chain guides: I'll probably do it every 80k miles or so - ECS Tuning sells the pair for $40-$70, depending on OEM or aftermarket. - Timing chain tensioner: IMHO, if you have more than 80k miles on it and you are doing this work, replace it - ECS Tuning sells for $20-$60, depending if you want OEM or aftermarket. Pull the dipstick and set aside. Disconnect the vacuum lines on the left and right of the valve cover. Remove the 2 brackets under the intercooler (one has 3 8mm bolts where you need a wobble extension, the other has 2 8mm bolts). Put a floor jack under the passenger rear corner of the oil pan and lift it so that it just barely supports the engine. Remove the engine mount (large u-shaped metal bracket just over the serpentine belt). There is a bolt on top of the engine damper, plus 4 18mm bolts that attach the mount to the engine. There is also a 13mm nut attaching a ground strap to the frame. Remove the many 8mm valve cover attachment bolts (you will need an 8mm DEEP socket for this as several are on tall studs and buried in a recess, so a box-end wrench will be hard to use) . IMPORTANT: Place paint marks (I had a paint pen... liquid paper was used in the video I recommend, above) on the timing chain and the timing chain gear so you can make sure they can be re-aligned perfectly when reassembling. In the photo below, you can see the white line I drew on the gear and the chain link (after cleaning off the oil). As long as these 2 marks are aligned when you reassemble, your timing will be OK.
Have someone sit in the driver's seat of the car, put the car in 6th gear, take their foot off of the clutch and hold the brake pedal firmly. 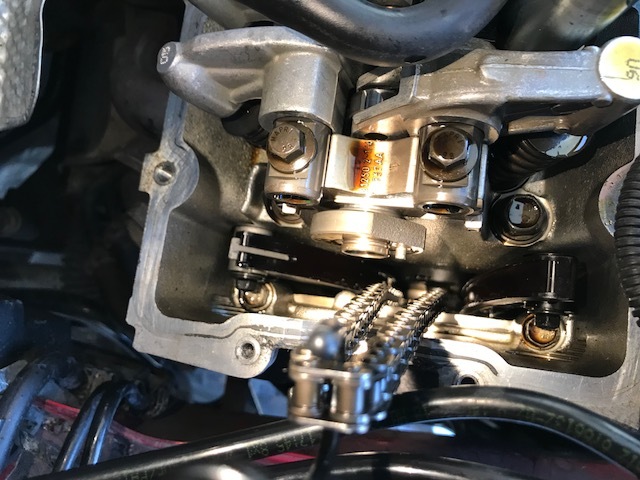 Remove the bolt holding the timing chain gear to the cam and then allow your helper to go about their lives for a bit (will need them for reassembly). Hang the timing chain from the bonnet by a bungee cord, so it is always held upwards (It shouldn't be able to slip off of the lower gear, but I'm not taking that chance). I've been told (after I finished the work and published the first draft of this article, so I can't confirm) that you don't have to remove the sprocket from the chain... that once you remove the bolt, you can just wiggle the chain guide rails out in step 19, below. It's probably still a good idea to mark the chain and gear as I did above... just to be safe. Remove the timing chain tensioner from the rear of the engine block. You will need a 19mm socket and a wobble attachment. It's on there VERY tight and is in a poor location. I lifted the passenger side of the engine a bit, using the floor jack, to give me better access from the top (I couldn't get a good angle on it from the wheel well... I followed the advice from the video and got it off fairly quickly. A bit of oil will leak out, but just a tablespoon or so. You won't need to drain the engine oil. Remove the 10mm bolts at the top of the timing chain guide rails (both front and rear) and replace the guides with new ones. You get to the 10mm bolts through the 2 large, round ports on the side of the housing. There is a pin at the bottom to hold the lower side of each guide rail... be sure the new rail sits down on the pin. Replace the bolts. Replace the timing chain tensioner that you removed in step 15. 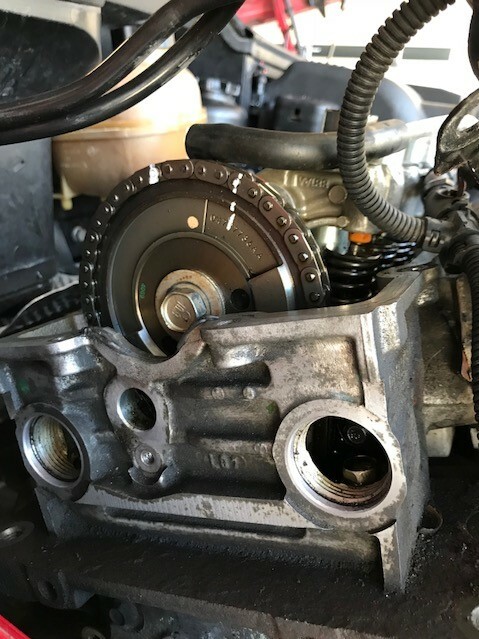 I put in a new one as the work is a bit of a PITA and I don't like to skimp when it comes to MINI reliability, but you can check to make sure that the piston moves freely, wipe it clean and reinstall if you wish. It is oil powered, so it's going to be drippy. There is a very high torque rating on this sucker (over 90-100 ft-lbs, if I recall), but I couldn't get my torque wrench down there anyway, so I just installed it as firmly as my short 1/2" drive would let me by hand. 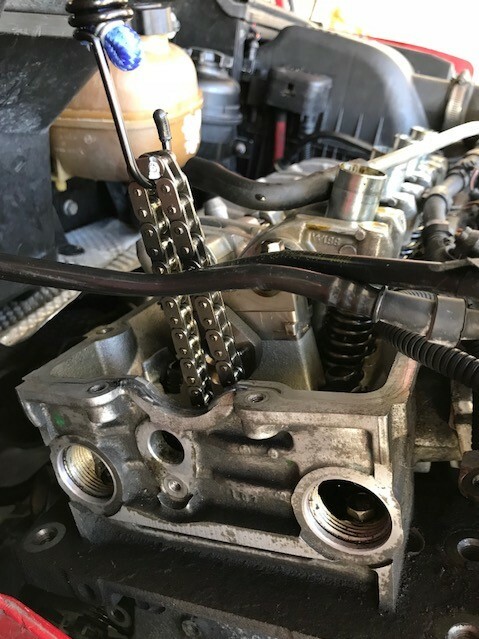 Reattach the timing chain gear, ensuring that the chain and gear marks you made earlier are aligned and the pin on the cam is in the hole on the gear. I got my wife back in the driver's seat to hold the brake w/ the car in 6th gear again when tightening the bolt. Put a new valve cover gasket on the valve cover. I also replaced the 4 spark plug tube seals. The valve cover bolts are tightened in a specific order, starting in the middle and alternating front and then back. Do one set to the left, then one set to the right, then one set to the left... continue until you run out of bolts. Tighten 'em in 3 stages... first just snug, then a bit tighter, then to the final torque. Tip: When I've got a nice list of instructions like those above, I'll take a box of sandwich-sized ziplock bags out to the garage with me. As I take off bolts, screws and small bits, I'll put 'em in the bag and then use a Sharpie to write the step number on the side of the bag. That way I'm not staring at a pile of screws when I start reassembly without any idea of where each screw goes. It really makes reassembly much easier.